Give your dry, damaged or coloured hair some intensive therapy with Aveda’s Damage Remedy Intensive Restructuring Treatment. Its advanced organic formula will deeply moisturise and restore your damaged hair to leave it boasting renewed health. 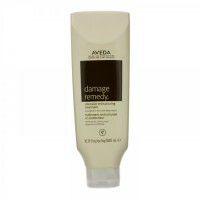 Aveda Damage Remedy Intensive Restructuring Treatment: Intensive hair therapy. Aveda Damage Remedy Intensive Restructuring Treatment is an intensive weekly treatment that deeply penetrates to help repair, seal and smooth even the most damaged hair. Using the power of pure plant oils and quinoa protein, it restores the health, silkiness and shine to your damaged hair. After shampooing your hair, smooth Damage Remedy from your roots to your ends.